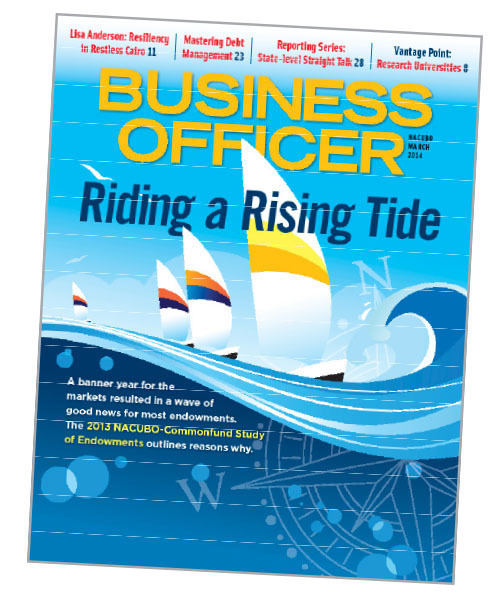 Once again, a magazine reader survey shows that NACUBO members are extremely satisfied with Business Officer. Closely paralleling the results of a similar survey conducted in 2010, the results of the recently completed survey show that 9 in 10 respondents rate their overall satisfaction with the magazine as “excellent/good.” The magazine earns an even higher score—96 percent—for credibility of articles, as well as equally high scores for overall quality and content. Almost two thirds of respondents read half or more of each issue. After reading Business Officer, readers say they are likely to call a colleague’s attention to an article (74 percent), copy or save an article (52 percent), and visit the NACUBO Web site (49 percent). About a third of respondents adopt a new strategy or modify a procedure as a result of something they’ve read, and nearly a fourth subsequently register for a NACUBO program or purchase a NACUBO product. Feature articles are the best-read element of the magazine, with 94 percent reading them regularly or occasionally. Other sections with high readership are the Business Intel and Federal File departments, along with Vantage Point articles and On Balance interviews—all redesigned after the 2010 readership survey. Respondents would most like to read articles on topics of planning and budgeting, finance, organizational effectiveness, leadership and communication, and federal government actions/public policy—a list very similar to the most-preferred topics in the 2010 survey but in a slightly different sequence. Again, as they did three years ago, respondents say Business Officer is the best-read of the publications in its market. Overall, 90 percent find it “extremely/somewhat useful,” followed by the Chronicle of Higher Education (64 percent), Inside Higher Ed (45 percent), University Business (39 percent), and others. The most striking change from the 2010 survey was the shift in preference for reading format. Now, half the respondents would like to access content through a combination of print and online delivery, compared to less than one third three years ago. Meanwhile, the proportion of respondents who prefer print only has declined from 60 percent in 2010 to 35 percent in 2013. Research was conducted with a questionnaire mailed to a random sample of 2,000 readers by Stratton Publishing and Marketing Inc., a media research and publishing firm focusing on associations, universities, and corporate clients. The survey returned a response rate of 18 percent, representing a confidence level of 95 percent with a margin of error of +/– 5.12 percent. Additional feedback about Business Officer from readers whose names weren’t selected for the survey is welcome at any time. Send your thoughts and suggestions to editor@nacubo.org. Two NACUBO events—the Global Operations Support and Compliance Forum, and the Student Financial Services (SFS) conferences—are now available online. The Global Operations Support and Compliance Forum examines international operations run by colleges and universities, with a focus on home-campus management and business support for programs operating overseas. The SFS conference covers the policy, technical, and management issues affecting student financial services operations on campus. On May 7, the 2014 Higher Education Accounting Forum will also be available online. This year’s program offers the latest information on trends and best practices in financial accounting and reporting, managerial analysis, and leadership issues for all types of institutions. For each program, NACUBO is offering your entire team one price. When one person on your campus registers at the full price, other staff can register for free. Each additional attendee must complete the online registration process to have full access to the event. All online attendees will continue to have access to the content for one year from the release date of the respective program. For more information, visit www.nacubo.org. NACUBO recently held a webcast that focused on the efforts of the Financial Accounting Standards Board (FASB) to improve the not-for-profit reporting model. How mission and resource availability influence operating results. What direct method cash flows mean in the proposed environment. How restrictions drive two revised net asset classes. Ways to explore pending decisions and gather information for balance sheet, debt covenant, and ratio analysis. Speakers included Jeff Mechanick, FASB assistant director, nonpublic entities, and chair of the Not-for-Profit Advisory Committee; Cynthia Pierce, partner, Crowe Horwath LLP; and Sue Menditto, director, accounting policy, NACUBO. The webcast will be available on demand for a year at www.nacubo.org/e-learning.html.